Carbon steel pipe fittings in the production due to the inner wall coated with lead powder will also have a lot of lead powder applied to the inner wall of the elbow pipe fittings,originally this powder is a particularly serious thing to environmental pollution,but produce a lot of pipe fittings cannot leave the lead powder,it is able to play a smooth effect to avoid seamless elbow pipe fittings in the production. Carbon steel pipe spraying sand removal has two advantages,the first can remove the inner wall of the elbow of lead powder this can meet needs of customers,because customers are also unwilling to have a lot of non-environmentally friendly things into the pipeline,especially water barrier media demand is more severe.But the hardware shopping mall shoddy elbow pipe fittings of the bottom are not sandblasting all into the mall installation to a variety of environments in the environmental pollution is very serious. 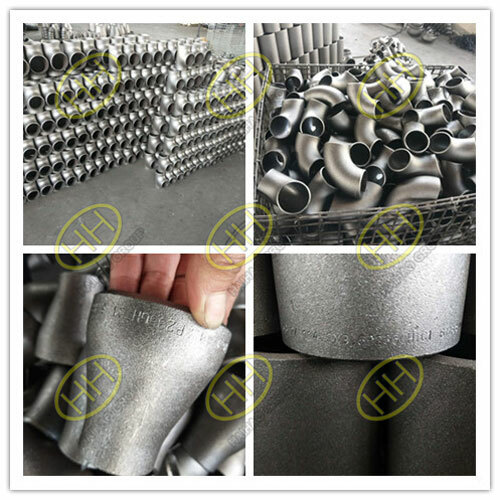 The second is to be able to find a lot of shortcomings of seamless elbow pipe fittings and then repair to make seamless elbow pipe fittings more beautiful.Carbon steel pipe fittings have certain corrosion resistance like oxidizing acid,organic acid,heat resistance and wear resistance. Usually used in power stations,chemicals,petroleum and other equipment. The above products are short radius,5 inch carbon steel elbows and reducers.They are being processed with blast sanding in Haihao Group. Prev： What is hydrostatic test?